Flamingo Gifts is an online shop specialising in unique and novelty presents. In a competitive market, Flamingo Gifts needed to ensure that they had the edge over rivals. As well as working on their SEO and launching a new site in Summer 2013, MoneySpyder’s in-house team took over the site’s email marketing campaign. Firstly, MoneySpyder developed a marketing calendar for Flamingo Gifts to introduce a more disciplined and forward thinking approach to their weekly emails. 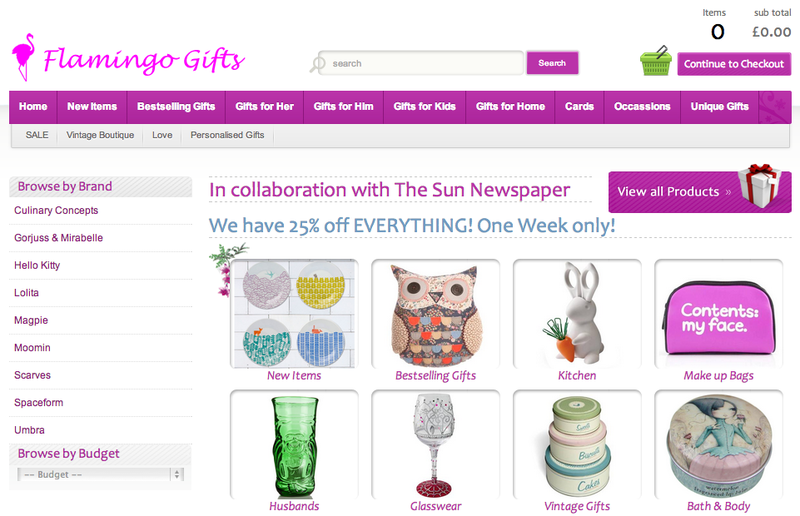 We also made the signup process much simpler on the Flamingo Gifts website. This increased the rate of list growth, which was highly beneficial in the run up to Christmas. We tested a number of email elements to ensure that each part of the marketing campaign was optimised. These included landing pages, enticing subject lines and different layouts in order to maximise engagement with customers. Are you interested in improving your email marketing strategy? Read more here or get in touch by email on info@moneyspyder.co.uk, or phone 0207 492 1929.